As summer finally shows its sunny rays, temperatures are rising each day and bedroom temperatures get warmer each night. A summer heat wave can result in the loss of 15 to 20 minutes of quality sleep each night. 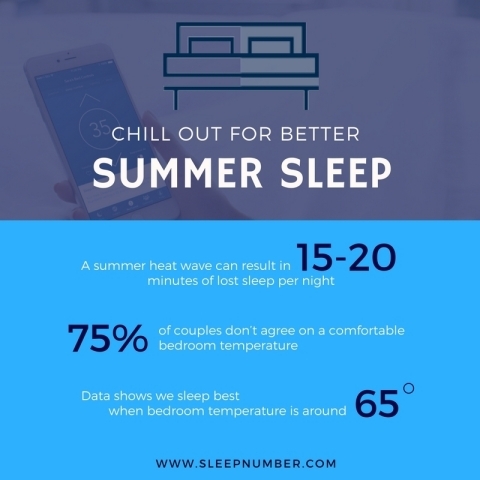 During a 2016 summer heat wave, Sleep Number’s proprietary SleepIQ® technology reported that for every 10 degrees that the temperature rose above the national average, people lost an average of 3 to 4 minutes of sleep. -- This topic makes millennial couples especially HOT – 44% of them (18-34 years old) discuss bedroom temperature at least once a week, while 30% of couples in other age groups report a weekly temperature discussion. -- Summer is the season when couples most often discuss bedroom temperature, followed by Winter. -- Take a shower before bed to warm your skin – this actually lowers your internal body temperature, which can help bring on sleepiness. -- Swap your bedding – if you find the bed to be too warm, try 100 percent cotton bedding. Many people prefer an open weave cotton blanket. -- Skip exercise and large meals before bed – exercising or eating before bed can raise internal body temperature, making it harder to fall asleep. -- Take the necessary steps to keep outside heat from getting in. This might include using blinds to keep out the sunlight, or keeping the windows shut. -- Try adding a DualTemp™ layer under the sheets. This can help both partners keep a steady temperature throughout the night. Thirty years ago, Sleep Number transformed the mattress industry with the idea that ‘one size does not fit all’ when it comes to sleep. Today, the company is the leader in sleep innovation and ranked “Highest in Customer Satisfaction with Mattresses” by J.D. Power in 2015 and 2016. As the pioneer in biometric sleep tracking and adjustability, Sleep Number is proving the connection between quality sleep and health and wellbeing. Dedicated to individualizing sleep experiences, the company’s 3,800 employees are improving lives with innovative sleep solutions. To find better quality sleep visit one of the 550 Sleep Number® stores located in 49 states or SleepNumber.com. For additional information, visit our newsroom and investor relations site.